Microsoft says its email service Outlook.com will now support Skype, allowing users to make audio and video calls right from their inbox. Consumer Reports today released the results of its annual computer tech support survey, which revealed that Apple bested its own scores from last year while also topping every other brand-name computer manufacturer. The company scored far higher than the other big companies for the elements that make for successful online and phone support: ease of contacting staff, clarity of advice, technical knowledge, patience, and time for follow-up. Although the full details of the survey are restricted to Consumer Reports subscribers, Macworld reports that Apple’s Genius Bar was able to solve 88 percent of problems for in-store support, compared to 73 percent for Staples’ EasyTech and 70 percent for Best Buy’s Geek Squad. Apple traditionally performs well in Consumer Reports’ surveys, and has been highly rated for a number of years. 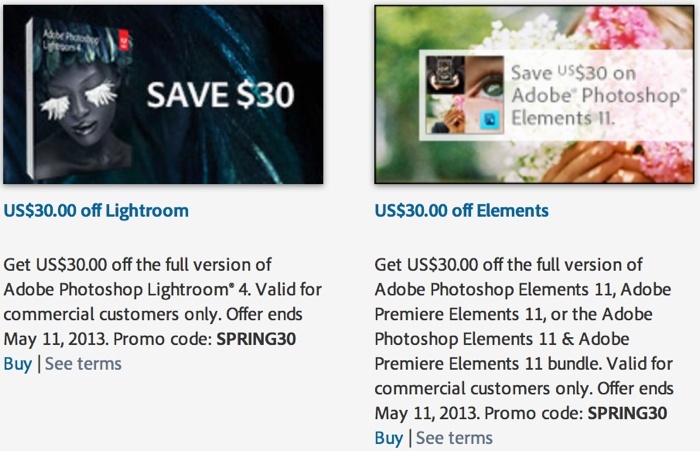 Adobe is offering customers a 20% spring discount on some of its editing software (via AppleInsider), dropping the price of Lightroom 4, Photoshop Elements 11 and Premiere Elements 11 by $30. Lightroom 4, originally priced at $149, is designed for photographers, offering up an array of powerful image adjustment tools. Though Adobe recently launched a beta version of Lightroom 5, the updated software will not be released until later this year. Adobe’s Photoshop Elements 11 provides several tools from the more robust Photoshop CS6 at a lower cost, and Premiere Elements 11 is designed for video editing. Both Photoshop Elements and Premiere Elements are priced at $99, though a bundle of the two is also available for $149. The $30 discount applies to the bundle as well as the individual titles. The discounted software can be purchased directly from Adobe using the code “SPRING30,” until May 11 when the promotion ends. Alibaba, China’s biggest e-commerce group, buys an 18% stake in Weibo, China’s Twitter-like service, as it looks to tap into the social media sector. 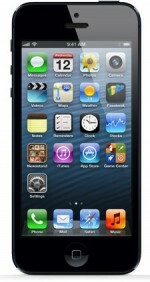 In mid–2012 rumors surfaced that Boost Mobile might begin offering the iPhone late in the year. Those rumors didn’t come to fruition, but a new tweet from @evleaks (via 9to5Mac) suggests that the Sprint subsidiary might gain the iPhone during the third quarter of 2013. If the rumor is true, Boost Mobile would become the fourth major prepaid carrier to offer the iPhone after Cricket Wireless, Virgin Mobile, and Walmart brand Straight Talk. Boost Mobile is known for its $50 per month plan, which includes unlimited talk time, unlimited texting, and unlimited data. With Shrinkage, a reward for paying bills in a timely manner, Boost Mobile unlimited plans can go as low as $35. 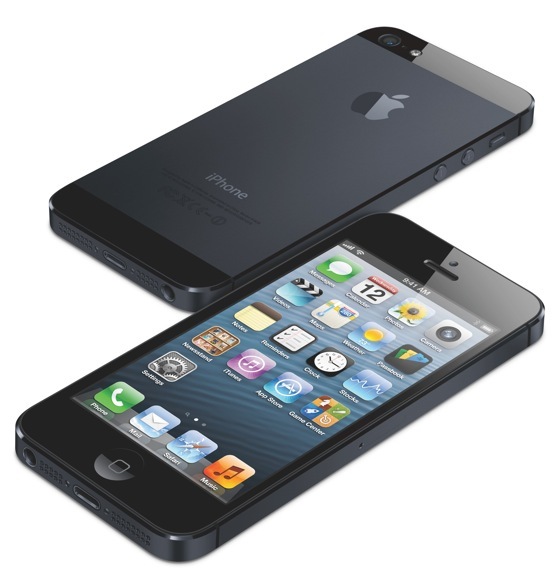 It is not known, however, if the carrier’s current plans will apply to the iPhone. The original iPhone will soon be considered obsolete in Apple Retail Stores according to an internal Apple document shared by 9to5Mac. Products considered ‘obsolete’ are ineligible for service parts and documentation at retail stores and cannot be repaired at mail-in AppleCare Repair Centers. Apple typically makes products ‘obsolete’ or ‘vintage’ five years after they are discontinued, though there are some exceptions where required by law. 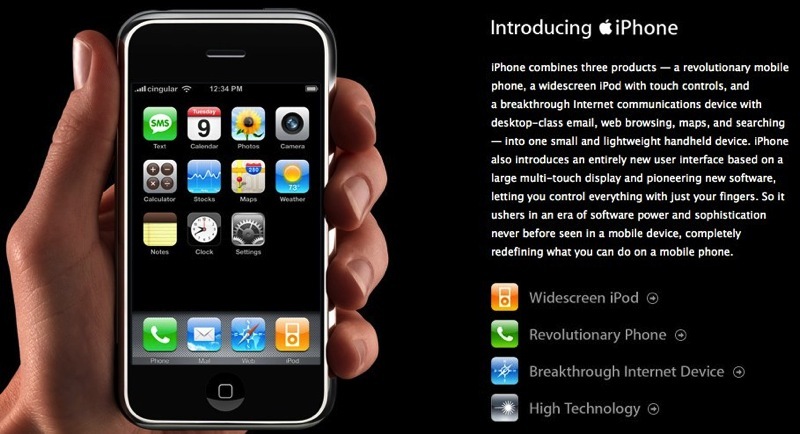 The original iPhone went on sale in June 2007 and was discontinued in July 2008 when the iPhone 3G was released. 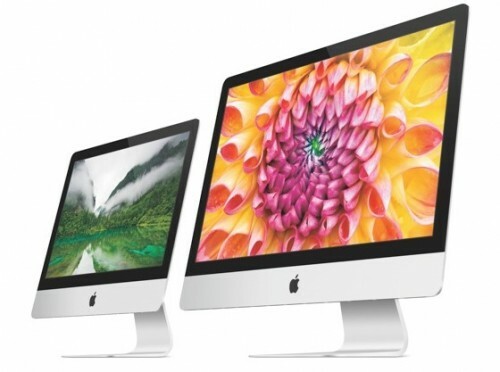 Other Apple products that will be considered ‘vintage’ as of June 11, 2013 include the mid-2007 models of the iMac, the late 2006 model Xserve, and the original Mac Pro. 9to5Mac has the list of newly minted vintage and obsolete products, while Apple maintains a list of all products named vintage or obsolete going back to the Apple II. How can video games have more minority characters? A jump in subscriptions to the software giant’s cloud computing software reveals that the company may be starting to edge into Amazon’s territory. Is Facebook Losing Millions Of Users Per Month? Has Facebook finally peaked? Social media was abuzz Monday with news that Facebook may be losing millions of users per month in the U.S., U.K…. Taking the bins out or feeding the cats is just a mundane duty to most of us, but we all know some people who do these everyday chores and receive wide recognition and rapturous applause. These people are Facebook Famous. They’re the winners of the most competitive popularity contest on earth and every aspect of their life is so damn fantastic that it needs to be shared with their legions of adoring friends. But how the hell do these cocky little upstarts do it and how can you achieve similar glorification from your online acquaintances? While brands and marketers are (rightly) concerned with ensuring their apps are downloaded, it really is only the start of the battle. More attention needs to be placed on the question, "has my brand created an immersive, compelling experience that adds real value for my customers?" Is A 4-Year-Old Girl Really ‘Addicted’ To Her iPad? Is WWDC Now To Big For One Show Only? 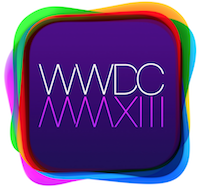 This past Thursday, 25 April, tickets went on sale for Apple’s World Wide Developer Conference, or WWDC, 2013. The event is know to sell out quick but this year it was almost absurd how fast it sold out. The post Is WWDC Now To Big For One Show Only? appeared first on AlliOSNews. As a part of The Huffington Post’s “iTheft” series of articles detailing the black market for stolen iPhones, the website has posted a new feature that takes an inside look at how the San Francisco Police Department handles its stolen iPhone sting operations. The man in the hoodie is indeed a policeman: Officer Tom Lee is playing the role of decoy in a sting operation targeting buyers of stolen iPhones. Beneath his sweatshirt, he wears a small recording device taped to his chest. Lee approaches a heavy-set man standing outside the red awning of a Carl’s Jr. burger restaurant. The man wears glasses and a black pinstripe suit. He inspects the iPhone and offers $100. Lee takes the cash, hands over the phone and gives the signal. Four officers swoop in and place the man in handcuffs, notching another arrest in the intensifying cat-and-mouse game playing out here and in other major American cities between law enforcement and criminals looking to profit from the burgeoning trade in stolen mobile devices. The sting operation was one of many set up to try to poison the iPhone black market in San Francisco with “fear and distrust” so that would-be buyers and sellers would be wary of engaging in any illegal transactions. To facilitate the arrests, the SFPD has solicited help from Apple. The company has loaned a number of iPhones to the department, which plain clothes officers “sell” while undercover. Officer Lee himself is an Apple “expert,” having been employed at an Apple retail store before joining the SFPD. As noted by The Huffington Post, the program has a number of critics that question both its efficiency and its legality, equating it to little more than entrapment. According to the San Francisco Police Department, nearly half of the robberies in the city have involved smartphones, which lines up with what a New York police officer said in 2011 when a similar sting operation led to 141 arrests. The popularity of the iPhone and the iPad has also led to additional crimes such as counterfeiting, which Apple has fought in the past through lawsuits. Instant messaging on chat apps, such as WhatsApp, has overtaken the traditional SMS text message for the first time, research firm Informa says. Apple Considering Lower-Priced iPad Mini at $199-$249? Along with his recent research note addressing Apple’s notebook launch plans, KGI Securities analyst Ming-Chi Kuo has also published a note examining Apple’s iPad prospects. In particular, Kuo looks to the iPad mini as the future of the company’s iPad portfolio, but with Apple’s efforts to bring a Retina display to the device said to be pushing a launch back to the fourth quarter of this year, he suggests that Apple may be looking at a lower-priced iPad mini. Prior to iPad mini 2 launch, Apple might roll out a more affordable iPad mini to compete with Android products. To cut costs, Apple might push for lower component prices, use a more advanced process to produce the A5 processor, simplify metal casing production, remove the rear camera, cut storage to 8GB and find more component suppliers to lower costs. We think this cheaper iPad mini retail for US$199~249. Kuo does not believe that such a device would offer a significant boost to Apple’s overall iPad sales, but it could help stave off erosion at the low end of the market at the hands of cheaper Android-based tablets. The $199-$249 price range is one that many potential customers had hoped Apple would be able to hit with the original iPad mini, but the company surprised many by introducing the iPad mini starting at $329. Even at that pricing, Apple has noted a number of times that the iPad mini’s profit margins are below the company average. Apple is said to be pursuing a similar strategy for the iPhone, working on a lower-cost iPhone with a polycarbonate shell rumored for launch later this year. Overall, Kuo sees relatively small sales growth for the iPad in 2013, with the full-size iPad being cannibalized by the popular iPad mini and the upgraded iPad mini with Retina display not debuting until late in the year. With Android tablets also beginning to gain footholds in some markets and driving Apple’s estimated share of the tablet market below 50% in recent quarters, Kuo expects that Apple will remain competitive but see relatively slow growth until the launch of the Retina iPad mini. If and when a cybersecurity bill moves to the Senate, the story about House passage of CISPA should not be about failure. A small robot has uncovered three 2,000-year-old chambers under an ancient temple in Mexico, archaeologists from the National Anthropology and History Institute announced this week…. Notebook Refresh to Be Highlight of WWDC, Non-Retina MacBook Pro to Continue? KGI Securities analyst Ming-Chi Kuo has issued a new report forecasting that the product highlight of Apple’s Worldwide Developers Conference (WWDC), which kicks off on June 10, will be the introduction of new models of the company’s MacBook Pro and MacBook Air lines based on Intel’s latest Haswell processors. The projection is in line with previous reports from Kuo and other sources, as well as recent claims that Apple will begin ramping up production of the new models in mid-May. On the MacBook Pro side, Kuo is reversing his earlier predictions suggesting that 2013 would see Apple discontinue the non-Retina MacBook Pro lineup and shift consumers to the slimmer and more expensive Retina line introduced at last year’s WWDC. Kuo believes that continued strength of non-Retina MacBook Pro models, particularly the 13-inch line, have led Apple to continue producing the non-Retina lineup for the time being. Contrary to our previous projection, we now think Apple will continue to make the MacBook Pro alongside the MacBook Air and Retina MacBook Pro because the 13” MacBook Pro remains the most popular product in the MacBook line. Also, there is still demand in emerging markets, where Internet penetration isn’t advanced, for optical disk drives. Kuo believes that the updated versions of the non-Retina MacBook Pro could begin shipping very soon after WWDC, but that the new Retina MacBook Pro models will begin shipping somewhat later due to production bottlenecks on the displays. For the MacBook Air, Kuo also believes that the new models will be introduced at WWDC and ship very soon after, but he indicates that Apple is unlikely to include Retina displays in the updated lineup. He believes that cost, thickness, and production concerns will continue to keep Retina displays out of Apple’s lowest-cost and thinnest notebook line for the time being. The following is a list of the notable medical apps released for Apple’s iOS this past week. Google acquires Wavii, a service that offer customised news streams to users, for roughly $30m (£18m) in cash. Which Mobile App Is The Most Addictive? In 2009, my friend Mike was getting into bitcoin and I remember him explaining the whole concept to me: A virtual currency managed by a peer-to-peer network open to anyone with a computer and uncontrolled by any bank or government. Intel has been synonymous with Windows PCs seemingly forever. But it’s trying to change that in a hurry. Enter Google. There are purists and variations. Successes and failures. Babies, toddlers, dogs and even a few full grown adults in the mix. A Giant Musical Instrument Made Of Lasers! Is Iran’s national internet intended to cut it off from the world? Apple today announced on its developer news website that it will be “hitting the road” with individual Tech Talk sessions for developers this fall (via The Next Web). The news comes a day after tickets for the company’s Worldwide Developers Conference (WWDC) sold out in two minutes. With the quick sellout, even some developers who thought they were purchasing their tickets in time experienced difficulties with the checkout process, and Apple contacted some of those affected developers yesterday to offer them a second chance at purchasing tickets. For those who missed out on WWDC tickets but would still like to take advantage of some the excitement and opportunities surrounding the event, a free alternative to WWDC called AltWWDC has also been announced. Still, demand for access to Apple engineers remains high, and the company has apparently seen fit to revive its Tech Talks tour in order to make contact with additional developers who are unable to attend WWDC. Apple has not yet announced which cities the Tech Talks will take place in, but the company may share more details around WWDC, which takes place June 10-14 at the Moscone West convention center in San Francisco. Apple last held its Tech Talks tour to support the launch of iOS 5 in late 2011 and early 2012, taking its show to 9 cities around the world. 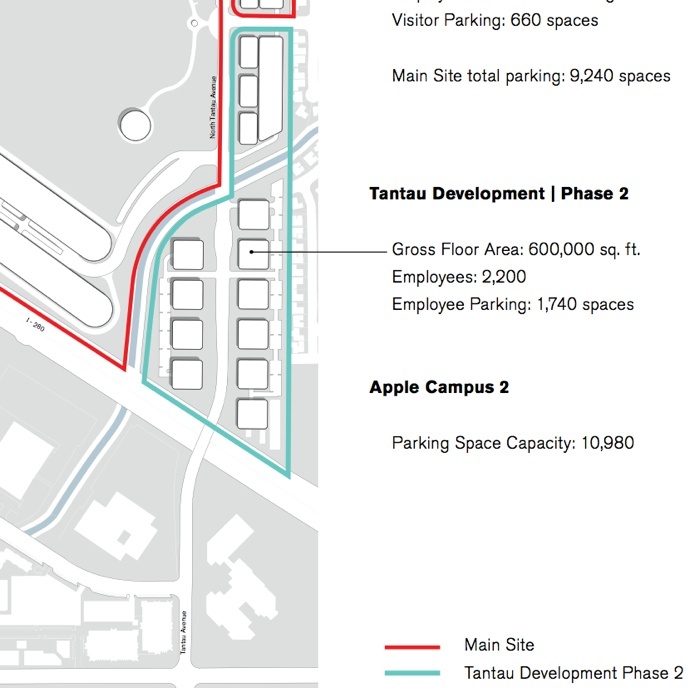 Earlier this week, Apple filed another revised plan for its “Campus 2” project in Cupertino, a new headquarters for the company focused on a massive ring-shaped building and designed to house 13,000 employees. 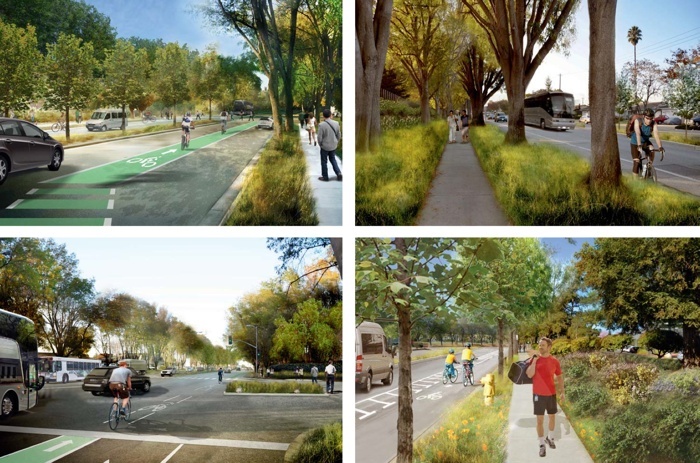 In line with that revised plan, Apple has once again solicited residents of Cupertino for feedback on the project now that additional details on environmental sustainability and neighborhood enhancements have been fleshed out. Apple made a similar mailing last May when the project was in an earlier stage of conceptualization. At Apple, the environment is a top priority, and we’ve designed Apple Campus 2 with cutting-edge features to make it energy-efficient and environmentally sustainable. Several of these green technologies are highlighted in this update. As at our existing campus on Infinite Loop, we are committed to 100% renewable energy to power Apple Campus 2. This will include onsite generation from photovoltaics and fuel cells. As part of this effort, approximately 8 megawatts of photovoltaics will be installed, creating one the largest installations of its kind on a corporate campus anywhere in the world. Apple started in Cupertino, and we are excited to continue to grow here. As we build the new campus, we also plan to invest in new roadways and intersection improvements, add new sidewalks and better bike lanes, and plant new trees in newly created medians in the surrounding neighborhood. As with the previous mailing, Apple includes a postage-paid response card allowing neighbors to provide feedback on the project and invites neighbors to view additional project details on the City of Cupertino’s website. 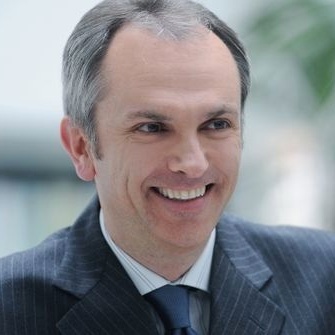 Former Xerox CFO Luca Maestri officially joined Apple as Corporate Controller in late February and a filing with the U.S. Securities and Exchange Commission published earlier today reveals that he received 38,091 restricted stock units (RSUs) in March of this year. As with most RSUs handed out by Apple, these carry staggered vesting dates with 1/8 of the total number of units converting to actual shares every six months over a four year period. Apple’s restricted stock grants are often issued as incentives to stay with the company because the shares vest over time and require employees to remain employed through each vesting date. At Apple’s current stock price, Maestri’s RSUs are worth approximately $15 million, but that total will shift depending on the stock price at the time that the shares vest. In his role as Corporate Controller, Maestri works directly under Apple senior vice president and Chief Financial Officer Peter Oppenheimer. Before serving as CFO at Xerox, Maestri formerly worked at Nokia Siemens Networks and GM. What The Heck Is A ‘Brinicle’? In a recent two-year long study, researchers have found tangible health benefits of the simple task of singing to your newborn child. The study took place at the Beth Israel Medical Center and followed the outcomes of introducing musical intervention to 272 premature babies in the NICU. The EyeWriter has been a journey, and due to the nature of ALS it’s a never-ending one. It started in 2008, and it continues on today. I am often asked, "Why did you do it?" Dell is offering something that’s rare on Windows 8 tablets: 4G connectivity. Maybe this should be more common. As Apple iPad users know, the option for mobile broadband has been around for years. Judge determines Motorola is entitled to $1.8 million in royalty rates for patents used in Xbox — not the $4 billion it had sought. Apple started running a new iPhone ad this evening entitled “Camera”. The ad is a departure from recent iPhone advertising, focusing on people actually using the phone, rather than just the phone itself. In a series of colorful shots, the iPhone is used to take photos and videos on a hike, a run, at the beach, on a walk, and more. The spot shows users editing their photos and using the iPhone’s panorama feature, as well as its LED flash. The ad finishes with the above quote, likely referring to statistics from Flickr that show the iPhone as the most popular camera on the service. Three of the top four most popular cameras on Flickr are iPhones and Apple has put a lot of effort into improving the camera in the iPhone over its past few iterations. Apple’s most recent iPhone ad campaign used a series of words flashing across the screen to showcase a number of different iOS apps. Samsung Electronics posts record quarterly profit, boosted mainly by growing sales of its smartphones. The time to start planning the next large international space mission is now. That mission should be a human mission to Mars. Despite the troubling economic and budgetary times, there is clear support in the U.S. for human Mars exploration. 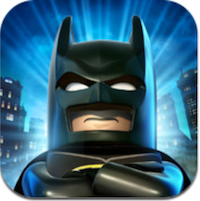 The latest release in the popular LEGO video game series from Warner Bros. Entertainment and TT Games, LEGO Batman: DC Super Heroes, has arrived in the iOS App Store. This also marks the first time a LEGO game on an iOS device has featured voice acting. Previously, LEGO games for the platform used pantomiming characters to express story elements. You’ll run around doing 3D platforming and light puzzle solving, all the while beating up on both bad guys and objects and then collecting the sweet, sweet Lego studs that are left behind, which are then used to buy different characters and other goodies. Lego Batman: DC Super Heroesboasts an 80 character roster, and not surprisingly it looks like you can buy studs as IAP if you desire. Following the introduction of the new ‘Decade of iTunes‘ milestone feature that debuted yesterday to celebrate iTunes’ 10th anniversary, Apple has sent out a hard copy of the timeline to journalists, reports CNET. 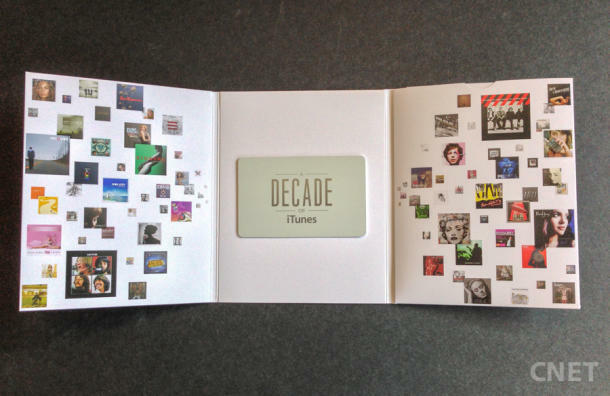 The paper version of the timeline comes with a gift card that features 100 free handpicked iTunes songs, along with a personal thank you note from senior VP of Internet Software and Services Eddy Cue. When Apple introduced the iTunes Store on April 28, 2003, we thought if consumers had a great, legal way to download music they would embrace it – did they ever. Apple was floored, as were the labels, when customers bought over 1 million songs during the first week. And now, 10 years later, we continue to be amazed by how much customers love the iTunes Store, with more than 25 billion songs sold. Apple loves music and strives to provide customers with the most innovative features and services on iTunes. We are all very proud of having such an incredible selection of legendary musicians on the iTunes Store and take great pride in exposing music fans to new and emerging artists. We’ve put together a compilation of 100 songs that represents milestones throughout the history of iTunes and shows just how far we’ve come. I’d like to thank our customers, label partners, and artists for being part of such an incredible decade. Apple’s digital 10th anniversary iTunes celebration features a timeline of events that covers the ten-year history of the iTunes Store, beginning in 2003, plus a list of the top-selling songs for each decade. Can you finally consign your files to the shredder? Tickets for Apple’s Worldwide Developers Conference sold out this morning in less than two minutes, leaving a number of developers with error messages stating that their purchase requests were unable to be processed. According to a tweet from Red Sweater Software founder Daniel Jalkut, Apple contacted some registered members of its developer program to offer them a second chance to purchase a WWDC ticket. Eric Doleki detailed his phone call from Apple in a blog post. I pick up and a nice guy tells me he’s from Apple Developer Support and that they noticed that I tried to purchase a ticket today and that the transaction didn’t go through. I told him that was true. I thought the next thing out of his mouth would be an apology or something – just to be nice. He then proceeds to tell me that he’s got good news – a ticket has been reserved for me in my name and that I’ll be receiving an email from Developer Support within 12 hours with instructions on how to purchase the pass. He thanked me for supporting the platform, etc. Dolecki’s story has been confirmed by several other developers on Twitter who have also received phone calls from Apple. The company appears to be offering tickets to developers who experienced a failed purchase after placing a WWDC ticket in their shopping carts. Apple’s Worldwide Developers Conference will take place June 10-14 at the Moscone West convention center in San Francisco. Tickets are priced at $1599. 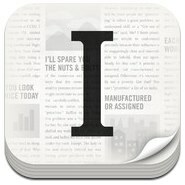 Developer Marco Arment announced in a blog post today that he has sold a majority stake of his read-later app Instapaper to Betaworks. That company owns Bitly, Digg, Socialflow and a number of other products. Terms of the deal were not disclosed. Arment said he would like to work on other apps and creative projects, including The Magazine, his medium-form iPad magazine. While technology has advanced since, considering close to a century has passed since the idea of a credit card materialized, it’s particularly surprising to note how little has actually changed with credit card technology. Dadi Perlmutter, Intel’s chief product officer, also tells CNET that devices running Intel’s mainstream Core line of processors could sell for as low as $399 to $499. Microsoft and PC makers shipped a little more than 3 million tablets in the first quarter, according to preliminary results from Strategy Analytics. Microsoft’s newest Xbox will be unveiled next month, and the next generation of gaming’s on the horizon. Here’s what we sincerely hope to see. Researchers create a new keyboard which they claim lets people “thumb-type” faster on touchscreen devices such as tablets and large smartphones. Earlier this month, a report revealed that Apple’s upcoming “spaceship” campus in Cupertino is both behind schedule and $2 billion over budget. Apple was said to be looking to cut costs on the project, which is apparent in the revised campus plans that it submitted to the city today. Apple originally planned on constructing a 600,000 square foot area of buildings (known as the Tantau Development) in two phases. Phase 1 was to take place alongside the construction of the main Apple campus, while Phase 2 would be delayed until later. Phase 2 includes 600,000 square feet of office, research and development buildings for up to 2,200 employees along North Tantau Avenue, providing flexibility to address future business needs. Construction of Phase 2 will follow completion of Phase 1. The Tantau sites will have small satellite plants. Apple’s revised campus plan includes the addition of an expanded section detailing bicycle access improvements, which comes with an included visualization of what bike pathways and sidewalks might look like on the campus. Also notable in the plan is a minor increase to parking availability and updates to public improvements, as well as a new section on Public Art that details four locations where the company plans to install art near the campus. Apple Campus 2’s budget rests near $5 billion, which is said to be because Steve Jobs insisted on design quality and expensive construction methods. The Campus, a circular 2,800,000 square foot 4-story building, is designed to hold 12,000 employees and has a prospective completion date of 2016. In 2013, if it doesn’t somehow make money for me, more or less immediately, having my head in "the cloud" takes on entirely new, and questionable, meaning. While you should always separate work from personal, for efficiency sake and to sometimes just be a better employee you use a personal email or a social media profile to quickly respond to a work inquiry. Charity auction site CharityBuzz kicked off a charity auction for a cup of coffee with Tim Cook this morning and the listing, which has an estimated value of $50,000, went from $5,250 to $100,000 in a matter of hours. owclarry – Larry O’Connor, the founder and CEO of Other World Computing, a company that provides computer upgrade products and services for Macs. “We would love the opportunity to sit down with Tim and maybe get some insights on where the future lies in his eyes,” he told MacRumors. rory.oneill3 (now charitybidder10) – Rory O’Neill, Vice President of Product & Channel Marketing at BlackBerry. PasswordBox.com – PasswordBox is a secure password management app which is currently restricted to VIP members only and is available on a wait list basis. Its CEO and co-founder is Daniel Robichaud. USocketUSBOutlet – U-Socket is an AC receptacle with two built-in USB ports, produced by FastMac, so this bidder is likely someone from the company. stephen.gill.777 – Stephen Gill, an online marketing executive and co-founder of Leadnomics. BGStucki – Brian Stucki, Owner of Macminicolo, a Mac Mini colocation service that stores users Mac minis in data centers for use as servers. At the moment, Other World Computing founder Larry O’Connor, who has been actively bidding throughout the day has the winning bid. Prolific bidder O’Neill previously had the username rory.oneill3, which has now been changed to charitybidder10. While we have confirmed that Stucki and O’Connor are the bidders behind their usernames, the remaining guesses are based on usernames that match up with known people in tech. The auction, which ends on May 14, will allow two attendees to spend 30–60 minutes with Cook at Apple Headquarters in Cupertino. Proceeds will benefit the RFK Center for Justice & Human Rights. Update: We have received an email alleging that the Rory O’Neill bidding in the auction is not affiliated with BlackBerry. Fast Company held a gathering of entrepreneurs, CEOs and those interested in business, media and technology at Terminal 5 in New York this week. Here are some brilliant insights that came out of "Innovation Uncensored." Showing support on your sleeve — while fairly trite since you’re only updating your status — makes sense to me. What doesn’t make sense to me are the brands that feel the need to insert themselves into the conversation surrounding a tragedy. Consumers these days are so inundated with shiny ads and gadgets that often the most effective way to communicate to them with impact is to go back to the basics: a barbecue and slip ‘n slide for rent in the heart of Manhattan. In less than three months, Internet Explorer’s nostalgia-heavy "Child of the 90s" video has been viewed a whopping 28 million times. The post Apple Seeds OS X 10.8.4 Beta 4 to Developers appeared first on AlliOSNews. Touch ultrabooks are coming down from their rarefied pricing tiers at the Micorosft Store. Australian police say they have arrested and charged a “self-proclaimed leader” of the hacking group LulzSec. The software giant says it now has patent deals with companies that make 80 percent of Andriod phones sold in the United States and a majority of those sold worldwide. Computer and smartphone maker Apple reports its first quarterly drop in profits in a decade, despite strong sales in the three months to March. During today’s Q2 earnings call, Apple announced that it had hit a milestone of 45 billion total app downloads, up five million from the 40 billion downloads that it reported in January. There are now 850,000 iOS apps in total, with 350,000 of those being iPad-only apps. 800 apps were downloaded per second during the quarter, representing almost 70 million downloads a day. 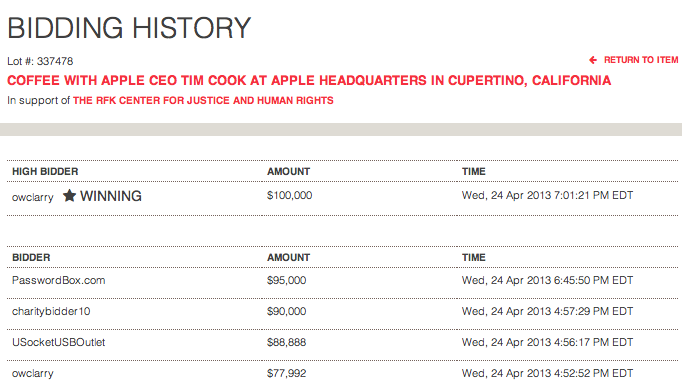 Apple has now paid out a total of $9 billion to developers, a $1 billion increase since mid-February. According to Apple CFO Peter Oppenheimer, Apple is now paying developers more than $1 billion per quarter, with approximately $4.5 billion being paid out in the last year alone. In total, Apple’s digital storefront includes music stores in 119 countries with 35 million songs, movies in 109 countries, the iBookstore in 155 countries and the App Store in 155 countries, covering 90 percent of the world’s population. The second quarter of 2013 brought record earnings for iTunes, with a revenue of over $4.1 billion, a 30 percent increase year-over-year. 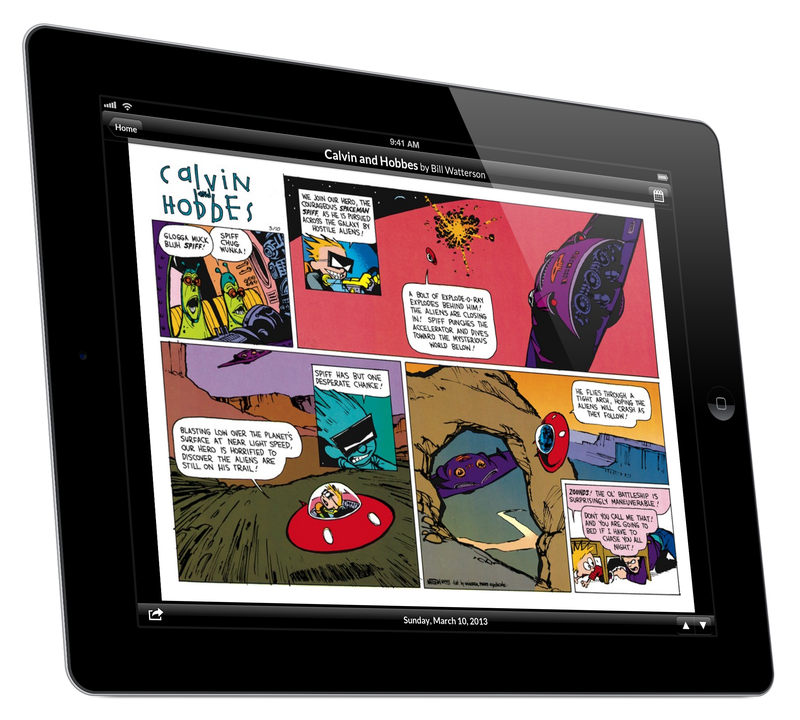 Uclick has released GoComics, an app that allows users to download classic comic strips to their iPad or iPhone for free. Like the accompanying website, the app includes 20 years of back issues of comics from notable strips like Calvin and Hobbes, Garfield, and Dilbert. Want funny? Love comics? We’ve got your fix. The GoComics app, from Universal Uclick, is the mobile comics portal for many of the most popular comic strips worldwide. From iconic favorites like Calvin and Hobbes, Peanuts, Garfield, Doonesbury, Dilbert and Marmaduke to modern favorites like FoxTrot, The Boondocks, Big Nate, Pearls Before Swine and Get Fuzzy, we offer the most diverse set of comic strips and panels in one single app for FREE. In addition to offering classic content, GoComics also features comics from emerging artists and modern cartoonists. The app’s content is updated on a daily basis to add new comics and users can both bookmark favorites and share comics via social networking sites or email. A robotic sidekick could soon be helping field engineers fix faulty equipment in remote and unfamiliar locations. Does This Trend Mean Doom For The GOP? 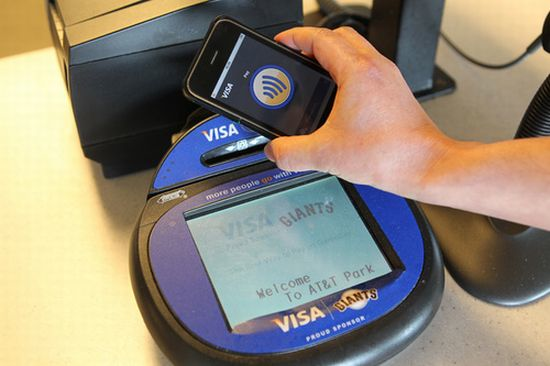 There have been persistent rumors for several product cycles that the iPhone would gain some sort of mobile payments system, perhaps through near field communications (NFC). Passbook, the system that Apple released last year to make it more convenient for customers using gift card or ticketing apps, could be a precursor to a larger mobile payments play by the company. Apple already has a mobile payments system of sorts, allowing Apple Retail Store customers to self-checkout with the Apple Store app. The company has hundreds of millions of credit card numbers stored in its iTunes system, providing a natural groundwork for a possible future payments system. The Associated Press news agency says its Twitter account has been hacked, after a bogus post about explosions at the White House. During the Q&A portion of today’s earnings call, Apple CEO Tim Cook was asked about the number of product releases in the fall of 2012 and whether he wished Apple had done things differently. His answer was somewhat revealing, as Apple is usually hesitant to disclose internal discussions and deliberations, but Cook said that looking back, he would have delayed the release of the new iMac until 2013 to avoid some of the the delays that many customers experienced after ordering a new Mac. I don’t spend a lot of time looking back except to learn from it. If we could run it over, I’d announce the iMac after the turn of the year. We felt customers had to wait too long for that specific product. Apple’s new iMacs, first announced in October, experienced significant delays in shipping, presumably due to the thinness of the machine. The displays required a new manufacturing process along with advanced welding techniques, causing some customers to wait for weeks before receiving their orders. During Apple’s Q1 earnings call, Tim Cook admitted that the iMac was constrained for the entire quarter, resulting in a “significant shortage”. While some advocate for technology as the key to higher student engagement and achievement, others worry digital tools will replace the teacher or hands-on, in-person learning. It’s a false dilemma. There have been numerous rumors claiming that Apple is working on an iPhone with a larger screen to compete with phones from competitors like Samsung, but Tim Cook’s comments during today’s Q2 financial results call indicate that the company is not quite ready to make a phone with a 5-inch screen. My view continues to be that iPhone 5 has the best display in the industry. We always strive to create the very best display. Some customers value large screen size. Others value other factors such as resolution, color quality, white balance, reflectivity, power consumption, compatibility of apps, and portability. Our competitors have made some significant tradeoffs in many of these areas to ship a larger display. We would not ship a larger display iPhone while these tradeoffs exist. It appears that Apple will not be releasing an iPhone with a larger screen until the company’s manufacturing partners can supply it with a 5-inch screen that meets its demanding criteria. The post Yahoo! Launches Updated Up for iPhone appeared first on AlliOSNews. First responders to the iPhone 4 antenna class action lawsuit are receiving their $15 settlement checks, reports to 9to5Mac. The settlement, which came about in February 2012, is limited to people who experienced antenna issues with their iPhone 4 but were unable to return their device and opted not to receive a free bumper case from Apple. Apple will provide a $15 cash payment to Class Members who send in a valid claim form. The claim form will require you to declare that you: (a) experienced antenna or reception issues with your iPhone 4; (b) were unable to return your iPhone 4 without incurring any costs; (c) were unwilling to use a case or free bumper for your iPhone 4; and (d) completed certain troubleshooting steps or are unable to complete the troubleshooting steps because you no longer own your iPhone 4. The first checks were issued on April 17, 2013 and are void after July 16. Apple accepted claims until August 28 of 2012. In an attempt to use the power of online communities, people scrutinzed photos and videos of the marathon finish line to find the bombers. It seemed as if that might help, but events didn’t quite work out that way. Canadian doctors say they have found an inventive way to treat lazy eye – playing the video game Tetris. A pre-emptive ban is needed to halt the production of weapons capable of attacking targets without any human intervention, a new campaign says. A French-language site offers the first glimpse of what it claims is Acer’s future 8-inch Windows 8 tablet. State-sponsored industrial espionage became a bigger cyber-threat to companies in 2012, reveals a report into data breaches. Apple has dropped the price on some of its refurbished iPads, offering an additional $50 discount on the iPad 2 Wi-Fi + 3G and the third generation iPad Wi-Fi + Cellular. Earlier this month, the entry level iPad 2 with 3G capabilities was priced at $399, but now the tablet can be purchased for $349, a total savings of $180. The entry level third generation cellular iPad was previously priced at $459, but can now be purchased for $409, a total savings of $170. The price drop applies to all refurbished second and third generation iPads with cellular capabilities, regardless of storage capacity. With 32GB and 64GB of storage, the iPad 2 Wi-Fi + 3G is priced at $429 and $529, while the 32GB and 64GB versions of the 3rd generation iPad Wi-Fi + Cellular cost $499 and $579. Apple is not offering further discounts on the Wi-Fi only versions of the second and third generation iPads, which remain priced at $319 and $379 for 16GB, respectively. As always, the availability of refurbished products from Apple’s online store is subject to rapid change. Refurbished units include the same one-year warranty as standard products, plus a new battery and outer shell. From putting a price on carbon emissions to floating green clouds, the tech giant outlines the steps it’s taking to promote sustainability from the data center to the desktop. What should Apple launch next? Not everyone believes Dzhokhar Tsarnaev is a terrorist. Despite seemingly overwhelming evidence pointing toward his involvement in the Boston Marathon attack a week ago, there is a group of people who know Tsarnaev who are remaining loyal to the 19-year-old. The Lyrid meteor shower will be peaking tonight, shooting as many as 20 meteors an hour right above your head. Not only does Euphonia challenge our everyday habits — whether it’s the urge to check our Twitter feeds, Instagram a photo, or refresh our inboxes — it leaves viewers with a heightened sense of awareness. Staggering data in a recently issued Jack Myers Media Economic Data Report projects a systematic shift towards digital advertising across 19 industries by 2020, with double-digit increases for all but two sectors. Lindsay Hoffman: The Printer Is Mightier Than the Gun? The 3-D printing story — accompanied by its biggest character, Cody Wilson – has received some attention, but is only in its beginning stages. That’s likely why it is not the top story of the day. Apple has won a small victory in its long standing case against Google’s Motorola, reports Bloomberg, after the United States International Trade Commission (ITC) upheld an earlier invalidation of a patent that threatened imports of the iPhone 4 into the U.S. The decision marks the latest instance in which neither Cupertino, California-based Apple nor Google has been able to strike a decisive blow against its competitor in a squabble that began more than two years ago. Each has claimed the other is infringing patents, and Apple accused Motorola Mobility of breaching obligations to license some of its most widely used technology on fair terms. Patent No. 6,246,862 references a “sensor controlled user interface for portable communication device,” or the sensor in the iPhone that prevents the phone from being activated when close to a user’s face. The dispute between Motorola and Apple began in 2010 after Motorola filed a lawsuit against Apple, claiming the Cupertino-based company infringed on eighteen of Motorola’s patents. After being acquired by Google, Motorola expanded its charges against Apple, stating that the company violated six patents having to do with iCloud. The patent that was invalidated today is the final patent in the above mentioned case, with all other charges against Apple previously cleared by the ITC. Google will likely appeal the decision, thus further extending the litigation between the two companies. Earlier this month, U.S. District Court Judge Robert Scola chastised Apple and Google for their patent disagreements, stating that the two had “no interest in efficiently and expeditiously resolving this dispute.” He gave the companies four months to streamline the case before it would be put on hold. A recent study discovered that Twitter users who see a retailer’s tweet are more likely to visit their retail websites and make online purchases. This article made me consider the impact of a tweet on online retailers. Jamie Bartlett: Is Twitter a Good Source of Breaking News? Following the Boston bombings, anyone following the relevant feeds and hashtags would have seen a surge of contradictory stories and speculation, some important and true, others later exposed as nonsense. Twitter is both an enormous rumour mill, and invaluable source of valuable information. I could end this article here, but academics have been studying this question in detail since at least 2010, so I’m about to get a little technical. The events last week were nothing short of horrible, although Bostonians and Americans together rejoiced on Friday as the second bombing suspect was captured…. Over the course of the past week, we witnessed the power of real-time news reporting with a major story. Here’s a look back at 50 tweets, including 15 pictures, and five YouTube videos (one for each day) that tell the story of the Boston Marathon bombing, from beginning to end. 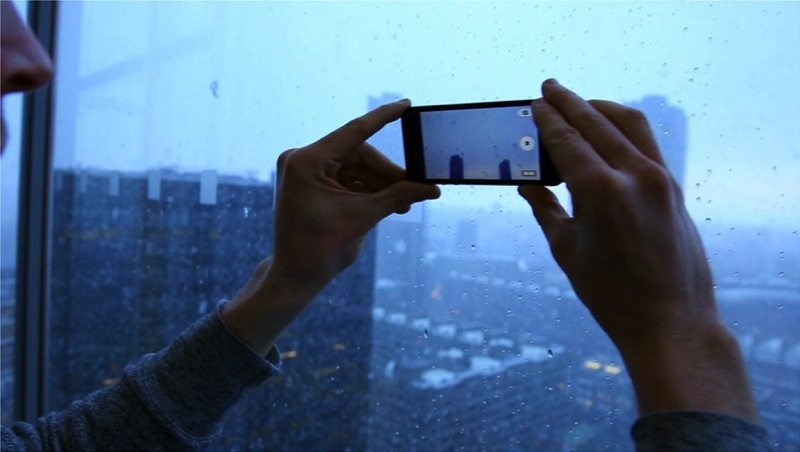 This week, starting with the tragic and sensless bombing of the Boston Marathon on Monday, through a riveting manhunt for two fugitive brothers, and ending in the death of one and apprehension of the other, Social Brother showed us just how powerful his genie (Internet+mobile+social+photography) has become. Surface Pro could shine if Windows 8 had been better designed to take advantage of its touch capabilities. The 787 is returning to the skies soon, but how was it done? You are currently browsing the DigitalWorkshed blog archives for April, 2013.